Flushing isn’t just an aspect of indoor plumbing—it’s also part of a well- managed flock’s nutrition and reproduction program. This article will address the whys and hows of flushing sheep and goats. What is flushing, anyway? The term describes a temporary but purposeful elevation in the plane of nutrition around breeding time. Its objective is to boost ovulation, conception and embryo implantation rates. Flushing may also increase the proportion of females that exhibit estrus. Boosting these rates increases lambing and kidding rates by 10-20%; this is important because a flock’s lambing/kidding rate is one of the primary factors influencing its economic viability. The lambing/ kidding rate (or crop) for a given season is the number of all lambs or kids born divided by the number of ewes or does that were exposed to a male, multiplied by 100 and expressed as a percent. An example: 175 kids are born to 100 does; the kidding rate is 175%. To flush, producers supplement the breeding flock with good quality hay, fresh pasture or grain for two weeks before and two to four weeks after breeding. Most literature pertaining to ewes recommends starting to flush two weeks before breeding; literature pertaining to does recommends starting three to four weeks before breeding. A New Zealand study documented a 25% increase in ovulation rates in ewes when they were fed one kilogram (kg) of dry matter (DM) per ewe per day for three weeks before breeding vs. those that were fed 0.5 kg of DM per head per day; a 30% ovulation rate increase was noted when the elevated DM plane was fed for six weeks before breeding. feed one-half to one pound of grain per head per day. Grain should be added gradually to the diet—for example, one quarter pound per day divided into two feedings for a few days, then increasing to one-half pound per day, then to three-quarters of a pound per day, then peaking at one pound a day—to avoid digestive upsets. Also, adequate bunk space is essential or some animals will get too much grain and others will get none. As mentioned, most producers flush by using one-half to one pound of grain per animal per day. Typical grains include corn, barley, oats, wheat and milo. If wheat is used, it should not constitute more than 50% of the grain ration or it will form a poorly-digestible mass in the rumen. Oil seed crops such as whole cottonseed or sunflowers could also be used but are probably cost prohibitive. Flushing with protein is advantageous if flocks are on a protein- deficient diet such as a low-protein pasture. Pasture can be set aside in advance so that it can be used for flushing, but it is best not to use legume pasture for flushing. Fresh alfalfa, clovers, vetches, birdsfoot trefoil and other legumes contain estrogen-like compounds that can interfere with estrous cycles, ovarian function, ovulation rates, cervical and uterine health, sperm transport and conception rates. Fescue grasses, barley grain, oat grain and moldy corn may also contain estrogen-like or toxic substances. Legume and grass hays do not have this estrogenic effect. increase a BCS by a half-score, so animals with BCSs below 3.0 may need to be flushed for three weeks before breeding. In addition to increasing the number of follicles released and reducing EEDs, elevated energy is believed to increase the number of embryos that implant in the uterus. Response to flushing is greatest in animals with below-average BCSs, especially those that were stressed by heavy lactation. Greater effect is also seen in mature females, at the beginning and end of the breeding season and in out-of-season breeding programs. No benefit is seen in animals with good or excessive BCSs or during the height of the normal breeding season. No effect is noted with ewe lambs, either, because they are already on a high plane of nutrition for growth. After the first month of gestation, the plane of nutrition fed to bred ewes and does can return to maintenance levels until the last six weeks of gestation, when fetal development begins to place significant demands on the dam. Graph 1 below depicts the energy requirement of a 154 lb. ewe at various stages of her productive life. 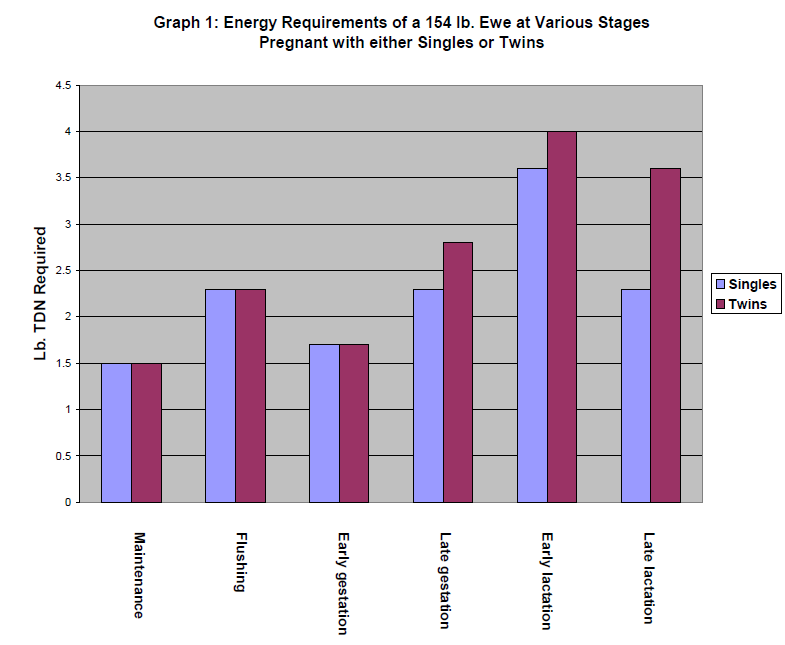 Note that the energy requirement for ewes is greater during flushing than for both maintenance and early gestation. second lamb or kid both pre-and post- natally; the first lamb or kid helps a producer break even and the second helps turn a profit. The bottom line: used strategically, flushing helps increase a flock’s bottom line.